Seine-Maritime, a land of light and contrast, is bordered by 120 km (74.5 miles) of high white chalk cliffs that enhance the natural beauty of the Pays de Caux coastline. 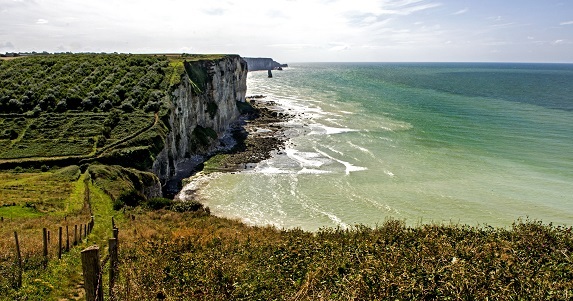 The Pays de Caux coastline combines vertiginous cliffs and dry-hanging valleys, lively ports like Dieppe, Le Tréport, Fécamp and small family-friendly seaside resorts with shingle beaches like Veules les Roses and Etretat, one of the most famous places in Normandy. From May to September, events like the Sea Festivals and the Tour de France à la Voile held in these seaside resorts attract visitors from all over the world and leave unforgettable memories. The numerous water sports activities, boat trips and cruises on board traditional sailing ships offer a different point of view of the Alabaster Coast from the sea. Stop looking: we have what you want!